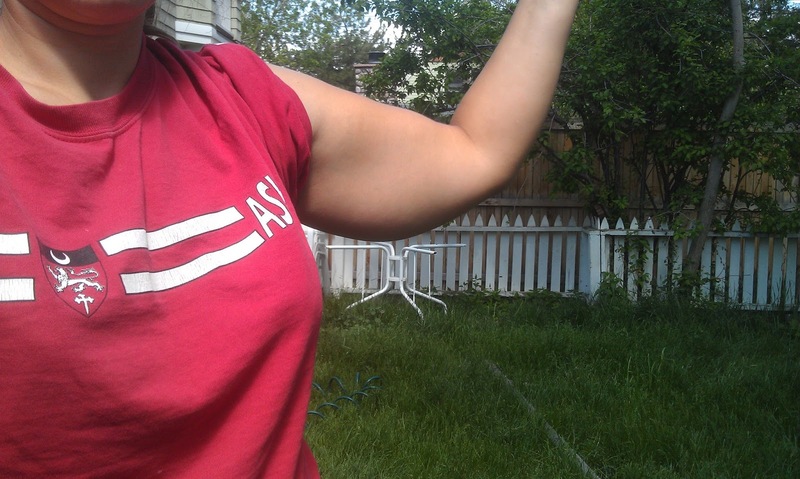 For as long as I can remember I've been embarrassed by my upper arms. For example, when I was at summer camp in high school, I was convinced the people laughing during pickup volleyball games were making fun of my flabby arms. Most likely they were just joking about our incompetence at volleyball, but I was convinced they were laughing at me. As you can tell, this part of my body has haunted me for years and even though I'm starting to look better in clothes as a result of my weight-loss, my arms are still a point of major self-consciousness. As a result, I've become determined to get rid of said bingo wings, or at least minimize them as much as my genetics allow. It's my next project on the list of ways to improve my lifestyle and body*. Now, I savor the junk food that goes into my body instead of stuffing it down my throat as fast as it'll go. I still get "the fix" but with fewer calories. Made exercise a near-daily necessity. I used to have to force myself to exercise once a week. These days the normal is to go out for a ride or a run and the abnormal is to sit and do nothing. Getting into better shape definitely helps with that. It's not nearly as painful (mentally) as it used to be. The act of working out still hurts but it's a good kind of hurt. As they say, "It doesn't get any easier; you just go faster." Became used to eating smaller portions. By now, I can't eat nearly as much as I used to be able to. I get full faster and am satisfied for longer. It's pretty awesome. Started eating leftovers...and liking it. This makes it easier to eat out less because that delicious food I cooked the night before is still waiting for me in the fridge. I still get grossed out by certain things and won't eat anything that's sat for more than a couple of days, so there is more progress to be made. But I'm getting there. So next is the Bingo Wings Project. I'll elaborate more on the plan of attack when I get one and/or stick with it for more than a week. This should be fun. *With the most recent attempt at losing weight (i.e. this one) I've gone with the method of moderation. There have been no sudden changes in my life, but instead I've incorporated one thing at a time and only when I'm ready for it. That's where the list comes into play. Now that I've fixed the major things that make the greatest difference in weight-loss (diet and exercise), I'm ready to start tweaking the little things like my arms.